The Trends in International Mathematics and Science Study (TIMSS) and the Progress in International Reading Literacy Study (PIRLS) are international studies directed by the International Association for the Evaluation of Educational Achievement (IEA). In Australia, the studies were managed by the Australian Council for Educational Research (ACER), and funded by the Australian and state and territory governments. The Trends in International Mathematics and Science Study (TIMSS) and the Progress in International Reading Literacy Study (PIRLS) are international studies directed by the International Association for the Evaluation of Educational Achievement (IEA). In Australia, the studies were managed by the Australian Council for Educational Research (ACER), and funded by the Australian and state and territory governments. 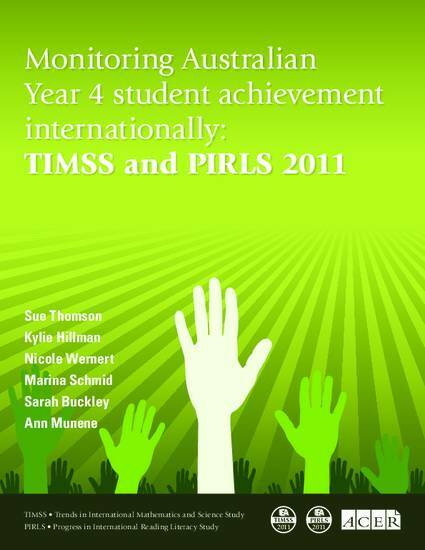 TIMSS and PIRLS share the goal of providing comparative information about educational achievement across countries to improve teaching and learning (in mathematics and science at Year 4 and Year 8 using TIMSS and in reading at Year 4 using PIRLS). They also provide comparative perspectives on trends in achievement in the context of different educational systems, school organisational approaches and instructional practices and to enable this, TIMSS and PIRLS collect a rich array of background information. This report analyses and interprets the Australian Year 4 data collected as part of the TIMSS and PIRLS studies. Where appropriate, this report makes comparisons with the results of other countries and the international average to better understand Australian achievement and its context. A companion report details the achievement of Year 8 students in TIMSS.